[May 17, 2010] SAN ANTONIO (AP) -- Deep in the heart of Texas, Adam Scott only saw Australia. Harsh scrubland off the fairways that reminded him of Brisbane and sandbelt greens that looked like home. 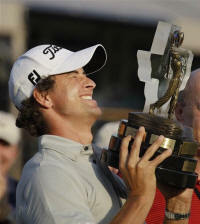 Rallying from four strokes back for his first PGA Tour victory in two years, Scott was 11 under in a 36-hole Sunday finale at the Texas Open, edging Frederik Jacobson by a stroke on the new Oaks Course at TPC San Antonio. DIVOTS: James Driscoll, who lost to Zach Johnson in a playoff last year at La Cantera, began the day one stroke back but couldn't keep up while shooting even par in the third round. He finished at 9 under. ... Sergio Garcia, a player consultant on the design of TPC San Antonio, was 1 under. ... John Daly withdrew because of hip problems after double-bogeying two of his first four holes in the final round. It's the second straight withdraw for Daly, who did the same at the Zurich Classic in April.